The whole family can enjoy world-class views at restaurants in San Francisco, the Peninsula or Marin. 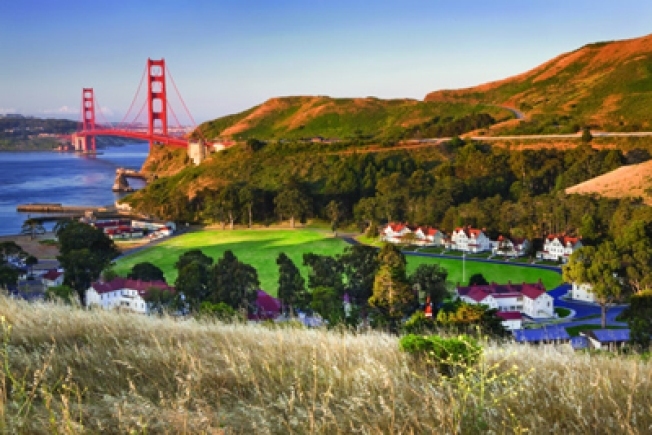 You can walk to the Golden Gate Bridge from the Cavallo Point Lodge in Sausalito. Knock-out views and good company go a long way in making a great dining experience but you’ll also feel like a million bucks in front of an ocean sunset. Now you can be king or queen of the world! For a full meal, that is, and if junior doesn’t melt down despite the view. The good news is, many of these restaurants with a view also offer outside areas where kids can shake their sillies out and that’s got to be worth something in meltdown prevention. Last but not least, a view on a boat harbor beats a street view any day to look out the window and forget about time – for all ages. Looking out at the Golden Gate Bridge and a boat harbor, Greens Restaurant is only steps away from the Marina Green and offers vegetarian food even non-vegetarians rave about. Between the child-friendly menu options and the produce grown at Green Gulch Farm in Marin, the restaurant is as good as the décor is fun. If you can’t score a window table, try to get one of the tables carved out of giant redwood trees by Bay Area artist J.B. Blunk. They’re out of this world and kids love them! Last word of advice: Sunday brunch. Seriously.